If you read enough Berrett-Koehler newsletters, press releases or emails, you’ll probably catch us “humble-bragging” about our mission, our focus on sustainability, and our community model. Sounds peachy, right? But how can you really be sure we’re not just all talk and no action? After all, in its final report to shareholders before all the perp walks, Enron’s team announced its core value was “Integrity.” Can BK (that’s what we call ourselves around here—I actually joked to the ex-CEO of Burger King once that we’re the “real” BK) prove that it’s doing what we say we do? Yes. Yes, we can. The number “95” proves it. 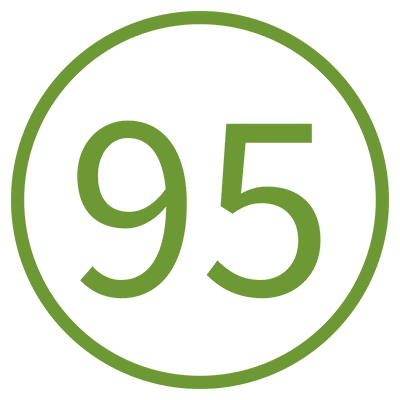 Ninety-five is the score we achieved on our “B Corp” recertification this month. Don’t take my word for it—every company certifying as a B Corp has to publicly post its results here. How hard is it to get a passing score? Let me tell you, it was kind of tough to get to this number. (Most companies taking the B Lab assessment for the first time score around a 55—it takes an 80 to “pass.”) Being a B Corp means providing hundreds of pages of documentation and undergoing an audit by B Lab, a nonprofit dedicated to the idea that there is more to business than just profit and stuffing shareholders’ pockets. B Lab examines a company’s operations and impact in excruciating detail, focusing on the areas of workers, customers, community, environment, and governance. Now, don’t get the idea that B-Lab has anything against being profitable. Profit is critical, of course, but recent trends in business law and court cases have suggested it’s the ONLY thing that matters—read about the Ben & Jerry’s takeover and google “shareholder primacy” if you don’t believe me. Most people across the political spectrum would agree that businesses should treat people, communities and the planets fairly, but the law doesn’t always agree with them. (Another book by BK, Corporations Are Not People, tells that story.) If anything, B Corps would argue that long-term profits are much better when companies consistently do the right thing, even if that bites into short-term profit now and again. To improve the legal right of companies to balance profits and social good, B Lab helped create a new type of corporation—benefit corporations—to protect that company’s right do good—even if shareholders get, say, a penny less in dividends once in a while. Berrett-Koehler was the first book publishing company to adopt this structure—at B Lab's urging—and the first publisher to be both a certified B Corp and a benefit corporation. Having this structure is step one, but it doesn’t mean much without that swanky B Corp score to prove you’re living up to your incorporation status. Why do benefit corporations matter? Now, I know some of you are chuckling at us do-gooders worrying about all this in a state where “Governor Moonbeam” runs the show. I must admit that we can lack a bit of awareness of how “crunchy” and “hippy” this all sounds to the uninitiated. Ironically, I think the work of our fellow B Corps is the last, best chance for free enterprise to survive as a system that creates wealth and rich people—equitably. Really, the opposite of the B Corps philosophy is the “laissez-faire”, winner-take-all capitalism that gave us the wonders of Deepwater Horizon, the Wells Fargo scandal, and Trump University. B Corp certification is an excellent way to give every employee in a company a long-term perspective and the incentive to do better. Your choice to buy from companies with a B-Corp score is a great way to think long-term as a customer, too.